Our favourite stage race of 2015 returns! The Critérium du Dauphiné, prior to 2010 known as the Critérium du Dauphiné Libéré, is one of the two pre-Tour de France form-test races (the other being the Tour de Suisse later this month). As its previous name suggests, there is another newspaper influence on the creation of the race. In 1947, local newspaper the Dauphiné Libéré set up the race to boost its circulation and showcase the Dauphiné region. The paper was the title sponsor until 2009, hence the expulsion of ‘Libéré’ from the title the following years. In 2010, ASO took over the sole running and organisation of the race. 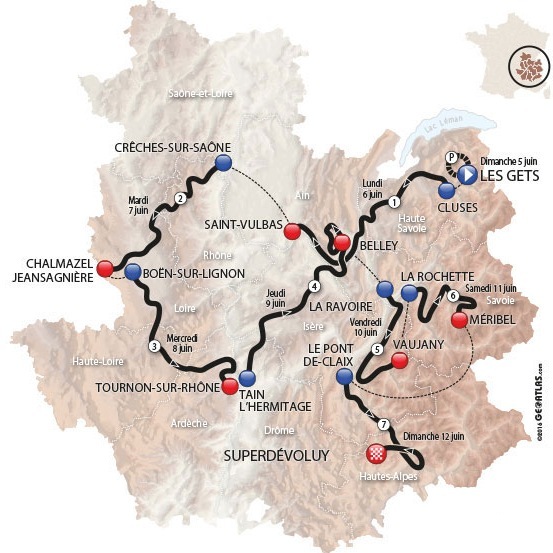 The favourites for this race will also be those in the running for the Tour de France the following month, due to the fact that the Dauphiné is set in the Rhône-Alpes region, covering portions of the French Alps, and so favors the climbers and general classifcation contenders. Many iconic Tour de France mountains appear in the Dauphiné, such as Mont Ventoux and the Col du Galibier. This year the Col de la Madeleine is the sole hors categorie climb. Chris Froome has won the Dauphiné twice, and each time he has gone on to win the Tour de France in that same year — so a win this week will be a good omen for July. This will only be his fifth race of the year, and, apart from winning the G.C. at the Herald Sun Tour in January, his form has been below his usual par. His stage win in the Tour of Romandie (which came thanks to a breakaway opportunity made possible due to his low G.C. placing) and 4th in the time trial there have been the only highlights over the last few months. How he’ll go this week is a bit of an unknown, but time is running out for the defending Dauphiné and Tour de France champion. Sky have also won four out of the last five editions of this race and come here with a strong squad. Mikel Landa‘s TDF spot will be judged on his performance this week, and after a disastrous Giro for him he will be wanting to show good form. If he does, then he is Sky’s Plan B for the Tour, and this will heap the pressure on Froome to perform. The return of Sergio Henao is welcome, and the UCI and Sky have judged him to have not commited any doping offences, so he is clear to return to racing. He will be another rider from the Sky roster looking to impress and pick up a result here. Sky’s maiden monument winner Wout Poels will be a huge asset to Froome in the mountains, and he’s also more than capable of acting as a back up G.C. rider if need be. Alberto Contador. So far Bertie’s swan song year hasn’t gone totally to plan. He has finished on the G.C. podium at every race he has ridden this year, but only once was he on the top step (at País Vasco in April), since when he hasn’t raced. He’s arguably in better shape than Froome at present, and he will we want to give an early warning shot to his main rivals at the race (a race he has never won, but finished on the podium three out of the five times he’s raced here). He lost one of his super domestiques, Michael Rogers, to early retirement, and so a lot of the support work will be on Roman Kreuziger‘s shoulders, who hasn’t raced since Liège-Bastogne-Liège, but who showed great form there by finishing seventh. The two young Danes Jesper Hansen, who finished second on G.C. at the Tour fo Croatia last month, and Michael Valgren, who was second at Amstel Gold, are bright prospects for the future, and both will be looking to secure their spots at the Tour de France in July. Fabio Aru hasn’t had a great 2016 for Astana; his best placing in a G.C. race was 6th at the Volta Valenciana back in early February. He crashed put of País Vasco and was a ‘DNF’ at Amstel Gold; this week is his first race back and he has it all to prove after Nibal’s Giro win last month. The prospect of having the Giro winner on his team at the Tour won’t be going down well with Aru, as the two riders aren’t the best of friends. He has the experienced Luis León Sánchez, Dario Cataldo, and Andriy Grivko as his main support riders. The young Diego Rosa looks to be a future Italian cycling great, in the mould of Nibali. He was 10th at Liège-Bastogne-Liège, and took a superb stage win from far out at País Vasco. If he’s allowed, he could do the same here. Richie Porte. Until the Tour de Romandie, Porte looked to be the better off between himself and BMC’s other main man, Tejay van Garderen. However, illness struck and he received a DNS on stage 2, and his teammate Van Garderen went on to finish 10th on G.C. Prior to that, Porte has finish in the Top 5 in three out of the four stage races he’s raced. Still yet to prove himself over three weeks, he is great over the week long races and, with Tejay at the Tour de Suiss, he’ll be hoping to better his 2013 2nd G.C. place here, and to channel the form he showed at Paris-Nice back in March. He has some powerful riders to support him, including Greg Van Avermaet, Rohan Dennis, and Ben Hermans, as well as climbing support from Brent Bookwalter (third in G.C. at Tour of California) and Damiano Caruso. Thibaut Pinot. A frenchman hasn’t won this race since Christophe Moreau in 2007, and Pinot could be the man to end that ten year drought. He has really stepped it up this year, with his and the FDJ team’s improved time trial – however, the mountain prologue won’t really showcase any of that improvement! His climbing (and descending!) has also vastly improved. He has finished in the top 5 in G.C. in every race this year, most recently second at the Tour de Romandie – missing out by 19″ to Nairo Quintana. A genuine contender for the win and even for a good placing in the Tour de France. Steve Reichenbach will be his wingman here, and he also had a decent Romandie, finishing eleventh. Romain Bardet is the other bright young G.C. hope for France and the AG2R man was arguably the rider of last year’s race, with his fantasic stage win descending into Pra-Loup. He had a poor Romandie, where he finished twenty-seventh on G.C., but he was never out of the top ten for any stage of the Giro del Trentino, finishing sixth overall. Having also finished 9th, 6th and 2nd on G.C. at Paris-Nice, Catalunya, and Oman respectively, he will be hoping his time in Switzerland was a blip. Alexis Vuillermoz will be his main support in the mountains, where the likes of Jan Bakelants and Alexis Gougeard targeting breakaway success. Outsiders: Joaquim Rodriquez, Dan Martin, Julian Allaphilppe, Adam Yates, Pierre Rolland, Bauke Mollema, Daniel Moreno and Tony Gallopin. We are back to having a traditional prologue kick things off at the Critérium du Dauphiné, after 2015 started with a road stage. But what’s this? This is no flat 6km jaunt around the city centre of Lyon or Nancy, but a gruelling 4km Cat 1 climb! This is why most of the time trial and prologue specialists are taking their business to the Tour de Suisse and letting the G.C. men and climbers fill their boots in the south of France. You wait two years for a mountain TT (three for a mountain prologue) to appear in a world tour race and then two come along in the space of three weeks! The torture starts in the centre of Les Gets. 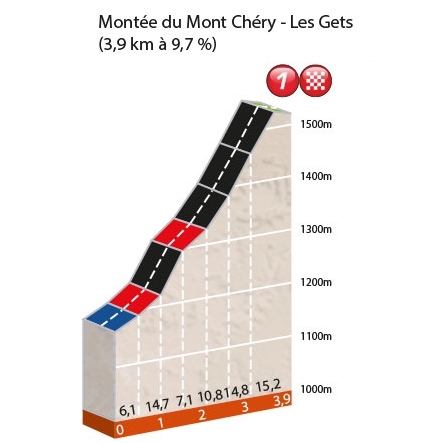 The Mont Chery climb is just under 4km long, averaging a horrendous 9.7% and maxing out at 15.2%. There are 11 switchbacks, which add to the steep average gradient. The first kilometre eases the riders into what is to come, as it only averages at 6.1%, after which the gradient doesn’t drop below 10%. Half of the 2nd kilometre is 14.7% and, in the last kilometre of the stage, the road peaks at 15.2% before levelling out at 6.7% for the run to the finish. The last time we had a mountain prologue was in the 2013 Tour de Romandie, where Chris Froome won. However, that climb was longer and less severe. The time gaps between the top 10 were only 18″. Today we are likely to see much greater gaps, like we did on Stage 15 of this years Giro. Even with the short distance, TT riders like Jérôme Coppel, Rohan Dennis, and Tony Martin will struggle here, as will the powerhouse riders Michal Kwiatkowski, Steve Cummings, Nikki Terpstra, and Greg Van Avermaet. This is one for the climbers and G.C. contenders, where huge early advantages could be taken, and this will give an early indication into the form of the main protagonists. The main men Froome, Contador, Aru, Porte, Bardet and Pinot should all be in the Top 10, not much needs saying about them. Anyone who doesn’t make it into the top spots today might have a hard time getting back later in the race. We fancy the two French men to be the best placed out of these six by the end of the stage. Sky have a super strong climber’s squad, and riders like Poels, Henao, Nieve and Landa will also be challenging for the stage placings here. Other domestiques like Kreuziger, Reichenbach, Caruso, Sánchez and Vuillermoz will also be up there. Dan Martin has had an inconsistent year and will look to channel some Ardennes-style punchy power to make a mark early on the G.C. Danny Moreno leads the Movistar team, with Quintana opting for training over racing, and he will be champing at the bit to show he is a worthy big race leader, so expect a good performance from him. We don’t think Rodriguez has the speed and power to compete on this stage, and he will look forward to the longer, tougher climbs to come – damage limitation will be his goal here, and the same will go for Rolland, Yates and Mollema. 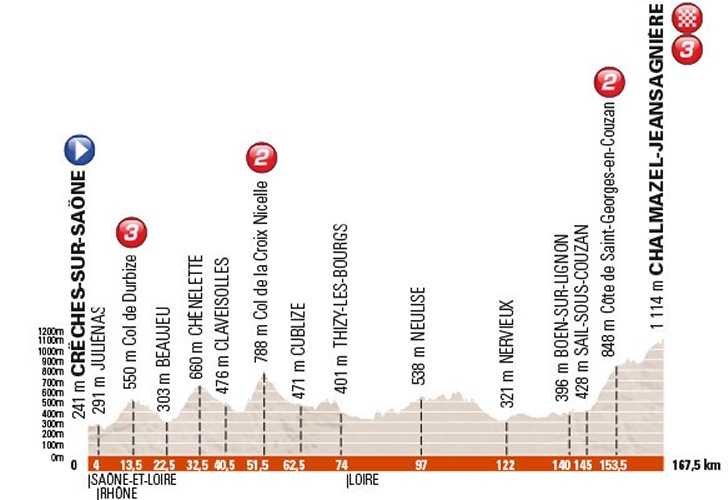 Tony Gallopin could surprise, and the short distance might suit him, as he has gone well against the main G.C. men in the mountains in races like Paris-Nice this year. The sprinters (and there are a few of them at the Dauphiné) have to work for their stage wins. The nature of the region means there aren’t any flat stages, with categorized climbs on every stage. 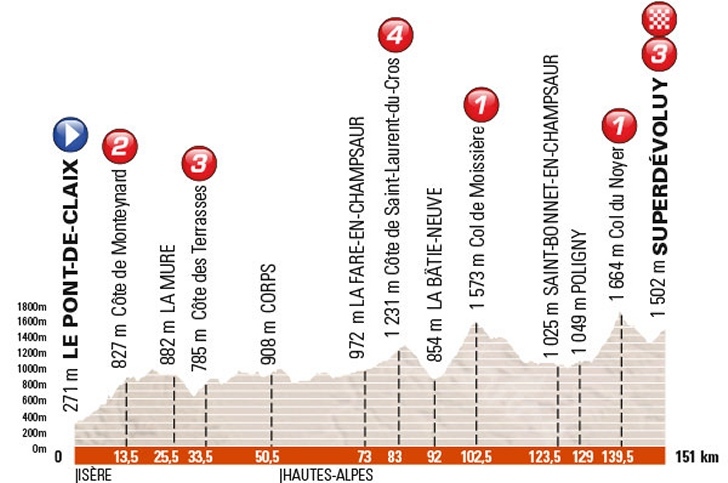 That being said, the bulk of the climbs (four category four climbs) take place in the first 75km of this 186km stage. These are the Cote de Mornex (1.6km, 6.4%) after 31km, Cote de Allenoves (1.3km, 5.7%) after 68.5km and the Cote de Chilly (1.6km 7.3%) after 75km. The final climb, Cote de Premeyzel (0.9km, 6.6%) comes with just over 50km remaining, after which the roads are flat with an easy run into the finish. The final few kilometres feature successive roundabouts and two sharp turns to be negotiated before the final kilometre along an unbroken straight and wide road. It’s unlikely we’ll see an escapee win like Peter Kennaugh’s last year, and a bunch sprint is pretty much nailed on. Last year Nacer Bouhanni took the other two ‘flat’ stages He has had some success in the recent French races, but was over shadowed by Bryan Coquard at the 4 Jours de Dunkerque. He’ll have the bearded cult figure of Geoffrey Soupe piloting his sprint train and he will be the favourite once again today. Alexander Kristoff looked to have rediscovered some of his early season form with third places and a win at the Tour of California. He’ll have a weakened train here as the team is built around the G.C., put he has the power to outperform Bouhanni. Sam Bennett was much talked about at the start of the year but failed to live up to the hype during Oman and Qatar. He took a won at the Criterium International against a weak field and with the ‘Flying Mullet’ Shane Archbold leading him out he could surprise here, but we’ve been saying that all year! John Degenkolb made his return to racing last month and managed fifth on the final stage of the Tour of California. He’ll be building up for the Tour here and would be aiming for another top five on these stages that favour the powerful as well as the fast. Trek come with with Niccolò Bonifazio, who finished in the top ten three times at The Tour of California, and Edward Theuns, who had a great classics campaign and took a win at last week’s Tour of Belgium. The last time they raced together was at Scheldeprijs, where their DS allowed them both to compete for the sprint — the Belgian finished fourth and the Italian fifth. It will be interesting to see if the same tactics are employed here. We also have all rounders in Greg Van Avermaet and Edvald Boasson Hagen, who dominated the early season hilly sprints on the Arabian peninsula. Both have continued their consistency this season and are likely to feature in the top 10. The sprinters have had their day, now it’s the first taste of the mountains for the GC riders. Not as stern a test as things to come, so the puncheurs and Ardennes classic specialists may be fighting it out for the win, with GC men content to man mark behind them. It’s a lumpy and undulating day in the saddle that lacks a gentle introduction — the first climb coming in the first 13.5km the category 3 Col de Durbize (4.5km, 4.8%). After this there is an uncategorised climb (which looks oddly like another category on the stage profile) before the category 2 Col de la Croix Nicelle (5.6km, 6.5%). After this the next 100km are relatively flat until the final 21kms and the final climb to the line. These final 21km look like a continuous ascent on the profile, but the race organisers have split it into two categorised climbs, with a flattish plateau in-between. 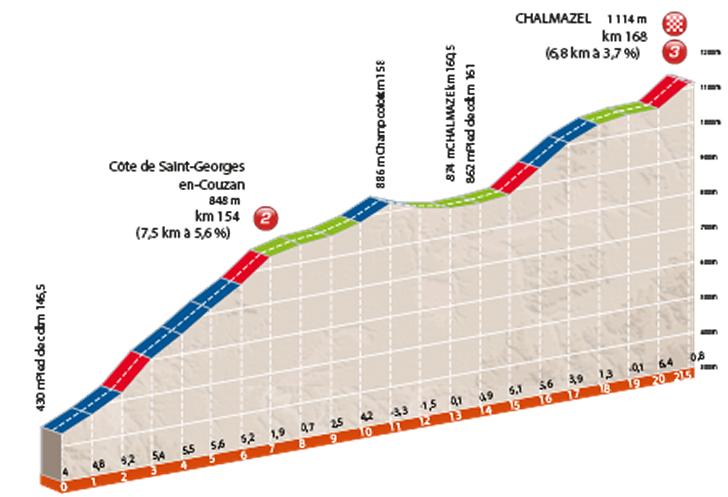 The first 7.5km make up the category 2 Cote de Saint-Georges-en-Couzan, it averages 5.6% and peaks at 9.2% in the first 2kms, after that it’s a steady gradient. After this we have another 7.5km stretch of road that makes up the link between the two final climbs, there is a small 4.2% lump in the middle and then a small descent that leads to the foot of the category 3 climb to Chalmazel. The climb is 6.8% long and averages just 3.7%, with the sharp 6% gradient coming in the first and final kms of the climb. After this there are 200m of winding roads leading to the finish. The most consistent riders during these races were Julian Alaphilippe, Enrico Gasparotto, Roman Kreuziger, Diego Rosa, Wout Poels, Jan Bakelants and Bauke Mollema and we would expect the top ten of today’s stage to be made up of these riders. Out of those rider Alaphilippe looks by far the strongest. His team mate Dan Martin also looks to be on good form following the prologue, but the man who beat to the win on Stage 8 of the Tour de France last year, Alexis Vuillermoz, could spring another late attack. Another rider who will favor a late attack towards the summit of the Chalmazel climb is Tony Gallopin, who had a good Paris-Nice, but a poor classics campaign apart from a third place at De Brabantse Pijl. Michal Kwaitkowski and Simon Gerrens also had poor classics campaigns and the Pole in particular is looks in great shape following the prologue. The uphill finish also brings into play Edvald Boasson Hagen and Greg Van Avermaet. Joaquim Rodriguez doesn’t look to be in great form after the prologue. At the race last year he very much rode into form during the week, so we’d expect him not to feature in the final moves of today’s stage. We’re going to stick our neck out and say it looks like it could be an Etixx – Quick Step 1-2 followed by Rosa, Gallopin and EBH rounding out the top five. Although the finish is flat — so on paper a sprint stage,– the profile is not. Today is another day for the puncheurs of the peloton, as the pure fast men will be saving themselves for an easier day tomorrow. The first half of this 187.5km stage will ease the riders into things, with a lump in the road at 48km the only early challenge. When they reach Monistrol-Sur-Loire at 73.5km the roads takes an upward turn, which leads to the first catagorised climb of the day, the category 4 Cote de Mointfaucon-en-Velay (3.5km, 3.7%), whose summit marks 100km of racing. In another ‘split climb’ categorisation the road continues upwards to top off another category 4 climb, Col du Rouvey (2.8km 5.6%). Expect the morning break to be full of early KOM hunters such as Daniel Teklehaimanot, who missed out on stealing the jersey on Stage 2. After a 40km descent, in which the break will have been either reeled in or have had their advantage reduced, we come to the main focal point of the stage – the category 2 Cote de Secheras. The climb averages 8.2% over 2.9km, however for the middle km the gradient averages 13.9% — not quite a ‘mur’, but close! 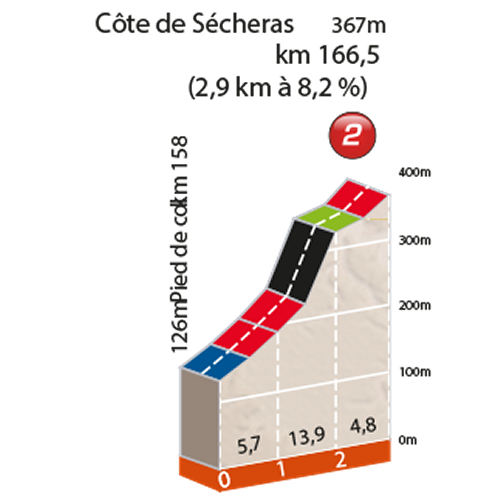 Once they have reached the summit the remaining riders (we expect the peloton to be blown to bits after the Cote de Secheras) will continue upwards for a few more, less severe, kilometres before tackling a long and windy descent until 5km still to the finish. The road to the finish is flat, but there are two roundabouts to negotiate. One of them comes with only 300m to go with a sharp right turn, so, depending on the size of the group contesting the finish, positioning could be key. The Cote de Secheras will do away with all the sprinters, who will have their eye on tomorrow. So we will be looking at the same riders who were in pre-stage contention for Stage 2. Out of those it’s hard to look past Edvald Boasson Hagen and Greg van Avermaet, who have the strength to contend with the final climb and the pace to contest the final sprint. It’s worth noting, though, that Boasson Hagen in particular looked to be suffering on yesterday’s penultimate climb. Having seen how Dan Martin and Julian Alaphilippe went on stage 2, a stage more suited to them, it looks like they may be taking the G.C. more seriously than picking up stage wins — so we’re not expecting them to be around for the finish here. Another rider who looks good, on paper, for this stage is Simon Gerrens. But he was dropped on the final climb of Stage 2 and really doesn’t look like the rider we know and love at the moment, although he and Orica could be saving energy for today. This is another stage that suits the versatile Tony Gallopin. He was outnumbered by Movistar in the sprint on Stage 2, and will be wanting to take a win on home soil. The AG2R duo of Jan Bakelants and Alexis Vuillermoz should also be there at the sharp end of the stage. Vuillermoz will be motivated by his crash on Stage 2 and has a fast finish as well as good legs on the climbs. Sky threw a number of riders up the road on Stage 2, in an attempt to tire out Tinkoff, so expect more black jerseys to appear on the final climb. Michal Kwiatkowski has the best sprint out of them, so if he can make the attack stick he could power away to the line. There are only two categorised climbs on today’s stage, both only category 4s, but the the profile isn’t as flat as that might suggest. With undulating lumps throughout the day, it will be a battle between the break and the sprinters’ teams in order to decide the outcome. This is the last chance for the sprinters to pick up a World Tour win in France before the Tour de France. All of them hauled themselves over the category 2 climb at the end of yesterday’s stage, only to be out-foxed by Fabio Aru’s well timed and unexpected attack just before the descent. Alexander Kristoff, who led the peloton home in second place, slammed his handlebars in frustration at the missed opportunity. This 176km stage will bring race back towards the Alps. 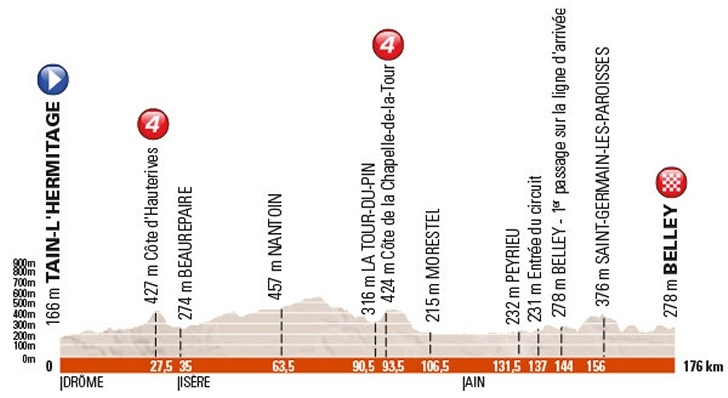 The two climbs of the day are negotiated in the first 100km, the Cote d’Hauterives (2.1km, 5.2%) at 27km and Cote de la Chapelle-de-la-Tour (1.8km, 5%) at 93km. A break should be allowed to get away and it will probably consist of KOM hunters and rouleurs looking to stay out there for the duration. Daniel Teklehaimanot, Alexis Gougeard, Steve Cummings, Luke Rowe, Alex Howes and Valerio Conti could all be breakaway contenders. Once the riders reach Morestel at 106km, the road becomes completely flat for the next 25km, and this where we will likely see if the break has a chance of making it to the finish. If the peloton let the gap remain anything above three or four minutes, then it will be tough to pull back over the final 40km, which is a lumpy circuit starting and finishing in Belley. The final 5km are along bendy roads, that include three roundabouts, one coming with 200m to go. So fighting for position and trying to pull back any attacks/remain escapees will be tough. The final km is also uphill, so any added difficultly for the pure sprinters. Alexander Kristoff was openly annoyed at letting yesterday slip, taking into account the finish and that added motivation, he will be the favourite today. Nacer Bouhanni isn’t the best at an uphill sprint, but he is great confidence after taking the win on Stage 1. The other battle will be between their two sprint trains, on Stage 1 head buts where thrown from both sides so expect round two this afternoon in the final few kilometres! Sam Bennett was 3rd on Stage 1 and 6th yesterday, and although his train can’t compete with Katusha and Cofidis, he is looking like he’s entering some good form and has the legs to keep pace with the two favourites. Another podium or, with a little luck, something more perhaps for him today. As its an uphill sprint, look to the likes of Edvald Boasson Hagen, Greg Van Avermaet and John Degenkolb. All have been up there at the end of the each stage and today’s finish level the playing field slightly. All are capable of taking the win here. The Trek duo of Edvald Thuens and Niccolò Bonifazio will also be up there. The Italian worked for his Belgian teammate on Stage 1 and was 3rd yesterday, so it looks like they might be drawing straws on the team bus each morning to see who gets the nod that day. Jens Debusschere took a great 2nd place on Stage 1 and will also like the tricky nature of the finish and the uphill sprint, so expect to see him challenging for a top 5 or better today. Now that the sprinters have had their time in the sun (and a brief spell in the rain, to boot), the points competition is looking particularly interesting in this year’s Dauphiné. After a stunning sprint to victory ahead of Nacer Bouhanni on stage 4, Edvald Boasson Hagen now leads the points contest by 4 points. However, the road only goes uphill from here, and Julian Alaphilippe — who put in a solid kick to the line himself — is only 13 points in arrears. Add to that the fact that Alaphilippe is best placed young rider, and is now only 9 seconds off the G.C., and we can expect Etixx to be riding on the front a lot these next few days. There’s also the small matter of the KOM jersey. Contador still holds it, ahead of Porte, Teklehaimanot, and Gougeard. Given the fact that there are enough climbing points within the first 80km of this stage to take the jersey, anyone with their heart set on the polka dots will look to get into the break today. Indeed, it’s barely 10km before the first cat 3 climb takes place, followed in rapid succession by a short descent and then a cat 4. No descent follows this time before the huge cat 1 climb up the Col du Barrioz. It’s a toughie, at 7.5km with an average gradient of 6.5%, but it’s fairly regular all the way up and so the challenge will be to find the right gear and stick with it. Here we’d expect the maximum time gap of the day to be well established by the break — perhaps in the 6-to-8 minute region. Immediately after the day’s big climb, there’s a cat 2, a brief plateau, and then a cat 4. 19km of rolling road follow before a cat 3 challenge, and then the riders gear up for a drawn out descent. Now, there are a good 25km or so of descent and then flat before the road goes up again, and a whole 50km before the final climb of the day up to Vaujany — this will be touch and go for a breakaway. In fact, given the usefulness of both seconds and points to a rider like Alaphilippe, we’d fully expect Etixx to aim to chase down the break by the final climb. Contador, too, will want to bolster his lead after the somewhat disappointing finish on stage 4 — he lost valuable seconds off his lead due to a gap in the peloton during the final sprint. The motivation of the G.C. teams heading into the mountains means bad news for the break in our view. 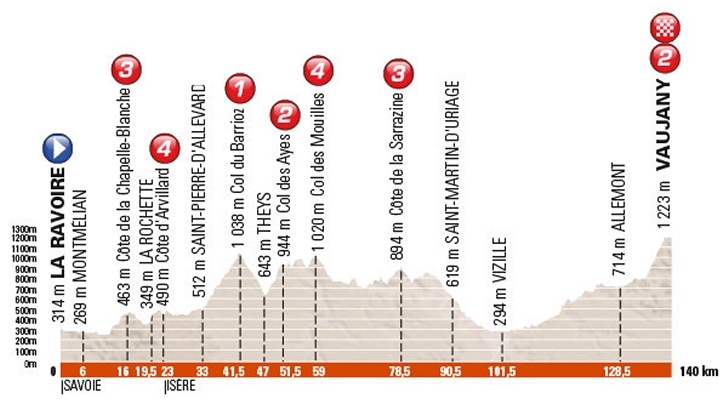 The Vaujany climb, whilst only a cat 2, presents a pretty serious challenge to the riders. It loses some of its average gradient (6.5% over a 6.4km climb) to the mild foot slopes and to the false flat before a brutal final 400m kick. The last ramp is over 7%, but the second kilometre of the climb averages over 10% — ouch. Expect the peloton to explode early on, and for a bunch of G.C. men and specialists climbers to rise to the top in a small selection, and for it to come down to a painful final sprint on that last 400m springboard. Prediction time. Now, ruling out a break because of the G.C. teams’ interest in the win here does not mean a G.C. rider will necessarily win. Though the break might get mopped up, the scene might still be set for a plucky rider to tear up Vaujany first. What we’re looking for is a decent climber with both staying power but also the ability to really surge for the line. It’s the sort of day Valverde would have loved. For that reason, we’re ruling out Alberto Contador, based on recent form. To lose seconds in a regular flat sprint finish, as he did on stage 4 and almost did on stage 3, is just not promising. If he wants to win this he’d need to out-climb the others early on, and this cat 2 ascent might not give him the advantage he’d need. We also don’t think that Fabio Aru will have what it takes to hit the line first, given his prologue performance. His stage win was a great demonstration of daring and tenacity, but it was also bloody lucky. Stage top 10 at best for him. We’d love to say that Edvald Boasson Hagen would make a good joker, given his sometimes surprising ability to keep the pace on the climbs and his determination to take the points jersey, but we’ve already seen him lose ground on the uphills this week and, really, this one might prove too high and too steep for EBH. Instead, we’re looking to Chris Froome and Julian Alaphilippe for this one. Froome is making something of a name for himself, always sprinting to the line even on the flattest of stages, and often finishing in the top 10 amongst sprint specialists. If his climbing form is good (and the prologue suggests it is) then he’ll be in the elite selection at the end of this stage, and few can out sprint him up the punishing gradients we’re likely to see. Alaphilippe, though, might well be one of them. He came second on stage 4 amongst the pure sprinters, beating an irate Bouhanni as well as Debusschere, Van Avermaet, and Degenkolb. It wasn’t the cleanest sprint, but that’s some power. Given his current form, he should at worst lose no time on this stage, and at best win the thing. But Etixx have two options, and we’re looking at Dan Martin to go well here. Dan put in an extraordinary uphill time trial during the prologue, and will definitely have the staying power to be at the head of affairs tomorrow. It’s likely that Martin and Alaphilippe will both be allowed to go for the win tomorrow, in which case Martin may well have the better sprint — he might, indeed, be our number one pick. We also have to mention the similarly-built and similarly in-form Tony Gallopin, though it’s less clear that Gallopin will make it all the way up the climb with the leaders. Sky have another option in Mikel Landa, but he may well be burnt out working for Froome. Richie Porte will be there in the finale, and we hope that Adam Yates will also have a go — he might need to try going long on the climb, in lieu of a sprint though. There’s also Joaquim Rodríguez, who we’d normally be rooting for on a stage like this, though his form has been patchy at best lately. Let’s hear it for Dan Martin. Stage 5 coughed up a few surprises, and didn’t play out quite as we’d anticipated. It was a spluttering stop-start affair for the breakaway, and, though there was a glimmer of hope for Dayer Quintana at one point, it all came back together thanks to a well-timed effort from Sky’s Mikel Landa. Landa also set himself up as a bridge for Froome, who put in an explosive attack far earlier than we’d anticipated, and took big time on Contador and all his other rivals — save for Richie Porte, who he towed to the line, and who lags behind him by 7 seconds on the G.C. Amazingly, Adam Yates and Dan Martin matched Contador’s climbing speed, and both beat him to the line. Martin lies only 10 seconds off the overall podium, and Yates is the same time behind Alaphilippe in the young rider competition. If Contador wants to win this Dauphiné, and send out a warning before the Tour de France, then this stage, the alpine Queen stage of the tour, is going to be crucial. Just look at that profile. There are ample opportunities for attacks today, and the potential for some enormous times gaps, with five categorised climbs including three cat 1s and the only hors categorie climb of the tour up the infamous Col de la Madeleine. It is also, like stage 5, a short and sharp stage, at 141km. Expect the pace to be high from the word go. The main determining factor in whether a breakaway lasts will be the Madeleine, the profile of which alone is intimidating. That’s 12 continuous kilometres of steep red on the official ASO imagery! It’s a whopping 19.2km in total, averaging 7.9%. It is very steep, but it is, at least, relatively consistent in its gradient. 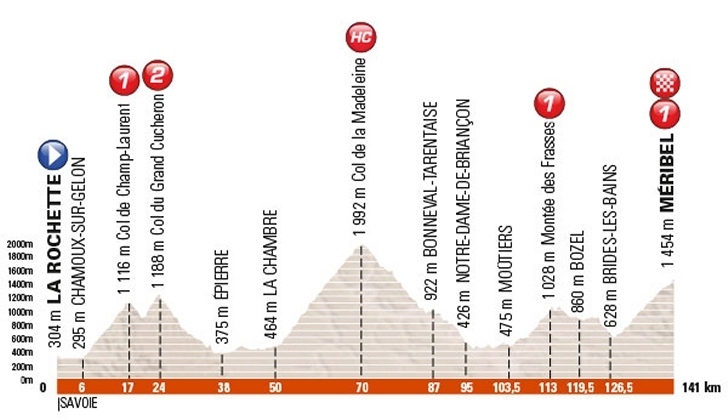 This is definitely one for the top climbers, and it’s easy to imagine that Daniel Teklehaimanot might lose his polka dot jersey to a more nimble rider here (there are 15 points to be had at the top of the Madeleine, and a further 38 on this stage). A breakaway of the right size — above, say, eight riders, and below twenty — and comprising riders low on G.C., could work well together on the Madeleine climb to get a big gap on the G.C. men. It’s going to be extremely difficult to control a race today, though God knows that Sky have a lot of firepower on their team. If Contador attacks here, though, dangerously early on in the stage (and he’s the sort of rider that might), then that will all go out of the window. A very long descent follows, which will allow for a little respite before the riders take on the Montée des Frasses. This is followed by a plateau, a short descent, and then the final climb of the day up to Meribel. It’s a significantly more forgiving climb than the Col d e la Madeleine, at 12.3km and 6.6% average. However, it’s less even in gradient, and features some steep ramps along the way, of over 8%. The final sprint to the line spikes up to over 11%, so we’ll once more be looking at riders who have a good kick when it matters. However, unlike yesterday, the riders will have done far, far more climbing before the finale. It’s going to be gruelling, challenging day, and jerseys might well change hands. So, who are the contenders? Well, it’s hard to look past Chris Froome. Froome went early on stage 5, but just kept it going. Only Richie Porte could hold the pace, and then at the end he was no match for Froome’s massive sprint to the line. If the form’s good and Froome sleeps well, we must surely be looking at those two riders again. Sky definitely have the team for the job, but it’s less likely they could play a hand like Landa’s move again here — it would be wise, though, to try to get Wout Poels into a break, as he also tried on stage 5. It’s hard to say what went wrong for Alberto Contador, but he just couldn’t find the acceleration. We’ve seen this in from Contador before, though, and if he’s not feeling like he could match Froome on the final climb tomorrow, then you can bet he’ll try from a long way out. He has good support here, but that might not matter if he can’t match those finishing moves from his rivals. It’ll be interesting to see if Dan Martin has the staying power for this one. He worked far harder than either Contador or Adam Yates in the stage 5 finale (that’s not to take anything away from either rider, though), and he practically dragged the second group on the road to the line. It now looks like Etixx are 100% backing him for a podium spot, so we can look forward to Alaphilippe working on the front for Martin. It’s going to be a tough day for Dan, but we hope he lasts. You can bet Orica will do all they can to keep Yates at the head of affairs, too, and he’ll have his sights on the white jersey, if not a top five overall. Looking down the list, we should note that Pierre Rolland came out of nowhere to take an impressive seventh on the stage. If you wanted to bet on the polka dot jersey, then it might be worth throwing something on Rolland; tomorrow is classic Rolland-in-the-breakaway parcours, and, though he might not last to fight for the stage win, he could easily mop up enough points to wear the polka dots. Romain Bardet also rode well on stage 5, and whilst we can’t see him being a threat to the podium here, he’s almost certain to finish in the top ten, and is riding into good Tour de France form. A Frenchman who is not, though, is Thibaut Pinot. Pinot lost over two more minutes on stage 5, and now has much to prove. He’s now practically eligible for a breakaway, so perhaps we’ll see him fighting for the polka dot jersey as consolation prize. A stage win seems well beyond him though, and that’s sad to see. A last possible breakaway candidate might be Fabio Aru, who also had a terrible day yesterday, but has shown his legs are still working with his plucky (and a bit lucky) stage win. For tasty outsiders on this tough looking Queen stage, look to good performers from stage 5: Bauke Mollema, Louis Meinjes, Diego Rosa, Joaquin Rodríguez. We think strong lieutenants will have worked too hard to fight for the win, so that rules out Alaphilippe and Landa. The Critérium du Dauphiné always goes down to the wire, and this year’s edition is no exception. With just over two minutes separating the top ten, everything is still up for grabs. The climbing on offer isn’t as intense as yesterday’s Queen stage, but, with two category 1 climbs in the final 50km, it will be another tough day in the Alps for the peloton. At 151km, it’s another short day but the pace is likely to be fierce, as all rider classifications are up for grabs on the final day. For the third day in a row, the organizers have designed a short, sharp stage in the Alps. They will be ascending from the word go, something the riders hate, up the category 2 Cote de Monteynard (10.6km, 4.6%) and after that the road keeps going up until they reach La Mure at 25.5km, where there is a short descent before the category 3 Cote de Terrasses. For the next 50km the road remains level though undulating until they reach the category 4 Côte de Saint-Laurent-du-Cros (2.8km, 4.9%), before we then move onto the meat of the day, and where the race will be decided. The category 1 Col de Mossière (8.3km, 8.2%) has a steep and constant gradient. It barely dips below its average of 8.2%, with it’s steepest sections coming in the final third of the climb, peaking at nearly 12%. The riders will then turn almost back on themselves as the head back towards the finish. The roads are relatively flat for the run in to the main, and final challenge, of the day: the category 1 Col du Noyer (7.5km, 8.4%). The early slopes aren’t tough, but after that the gradient doesn’t dip below double digits. It’s a brute of a climb at the end of three hard days in the Alps. 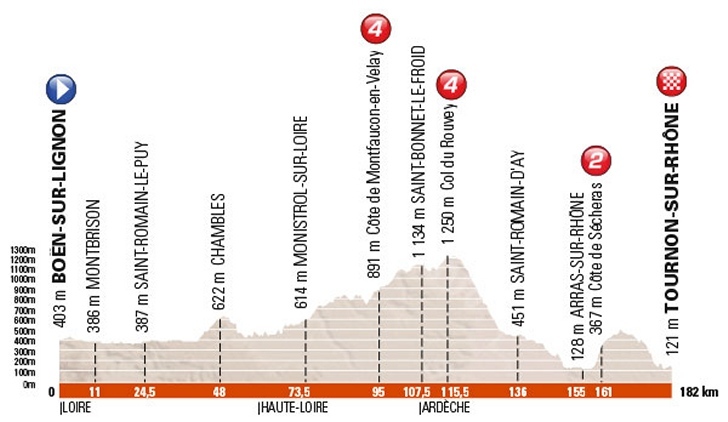 It’s not over yet though, with the final climb to the finish in Superdévoluy averaging 5.9% over 3.8km. 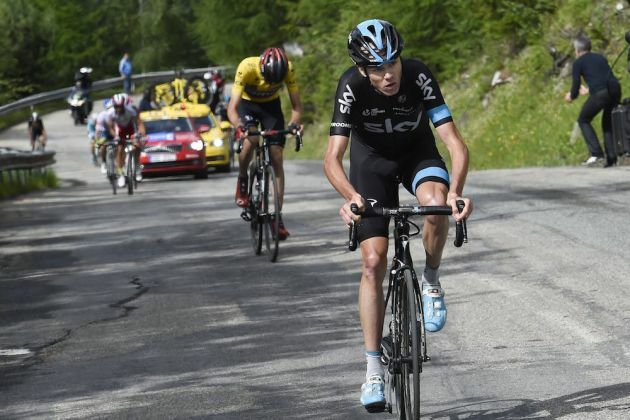 The same finish was used on the penultimate stage of the 2013 race, and Porte and Froome both finished in the Top 10. With the time gaps still tight on G.C. a break will probably be allowed to get away early, depending on whether Thibaut Pinot is in it trying to cement his KOM jersey against Daniel Teklehaimanot and Tsgabu Grmay. Pinot is just over 2 minutes back from Froome, and, whilst not a direct threat, he won’t be allowed a great advantage. If a break does get away then you can expect the likes of George Bennett, Joaquim Rodríguez, Daniel Navarro, and the Trek duo of Bauke Mollema and Ryder Hesjdal to be amongst it, hunting the stage win. The final climb to the line will suit Dan Martin and Julian Alaphilippe, but the challenge for them is keeping pace with the others over the more severe slopes. Martin has ‘sprinted’ well at the end of the previous two Alpine days, so if he’s there again we’d pick him to take the win and (possibly, hopefully) a podium G.C. spot. The man who pushed him off it today, Romain Bardet, will have something to say about that though. Bardet is another man who has been ‘sprinting’ well at the end of the climbs, though he missed out on taking the G.C. thanks to the efforts made by Team Sky, and is now on equal time with Porte. He will be going double or quits for the overall win. Richie Porte losing time today was a surprise and he will want to keep his podium spot and also try and attack Froome for the overall. We are yet to see him get one over on his ex-teammate and tomorrow could be that opportunity. However, Chris Froome is the strongest rider is the race with the strongest team, it will take a huge effort from the rest to wrestle the jersey from Team Sky. One man who you can bet your house on attacking is Alberto Contador. We wouldn’t say that the G.C. is out of reach for him, but his riding in the mountains this week has looked more like he is testing out tactics than striving for a clear win. You can never write him off, but Froome looks to have the edge over Contador so far this week. Depending on what Alaphilippe does, Edvald Boasson Hagen looks good to take the points jersey this week, after he cracking win on Stage 4 (Julian would need a clear win or second on the stage here to take it). Alaphilippe is currently leading the young rider classification, but Adam Yates and Louis Meintjes are only 6 and 39 seconds behind him respectively. Both have ridden superbly this week, so expect them to be animated in the final 50kms to try and steal it from the Frenchman at the last. It would be a great and fitting end to Yates’s Dauphiné if he got on to the podium on this stage, too.